Tired of the same old spinach or kale green smoothie? Mix things up with arugula. Arugula has a strong bitter or almost peppery taste, a result of the alkaloids, or plant medicine it contains. Arugula is classified as a cruciferous vegetable along with broccoli, cauliflower, cabbage, kale, collard greens, and others. This class of vegetables are renowned for their protection against cancer. Here are the top health benefits attributed to arugula and most cruciferous vegetables in general. Arugula contains important phytochemicals, vitamins, minerals, and antioxidants. The phytochemicals in arugula have been shown to detoxify carcinogens before they damage your cells. The beta carotene (lutein and zeaxanthin) present in arugula is a potent antioxidant. These are believed to be the one-two punch that make it such a powerful cancer preventative. 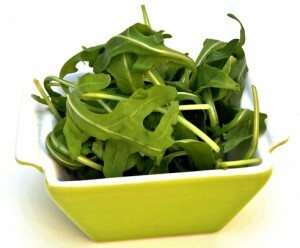 Low in calories, arugula is a great source of dietary fiber, vitamins C, A, K and P, iron and potassium. Arugula is also great for improving the quality of your blood, and known for its aphrodisiac qualities. Many health experts recommend eating several servings of cruciferous vegetables per week. Is there an easier way than blending into your smoothies? For more information on the array of health benefits cruciferous vegetables have to offer, click here. A little arugula can go a long way in the taste department; so I suggest using 1/2 cup arugula and 1/2 spinach the first time you try it in a smoothie. Unless you’re adventurous or not adverse to an overly bitter/peppery taste, go ahead and use a full cup. Place all of the ingredients into your high speed blender and blend for 30-45 seconds or until desired consistency is reached. Please leave a comment below if you try this arugula green smoothie. Happy Blending! It’s yummy! I substituted the berries with acaí. It would take alot to cover the taste of arugula. But I don’t mind it. Thanks for the recipe! Nice substitute, Sophia. Glad you liked it. Your version looks delicious, thanks for sharing. I especially like the addition of avocado for texture and healthy fat. Don’t mind taste of arugula! I added some cacao powder and it tasted great! Thank you! Thanks for sharing, Catherine. I actually like the taste of arugula and eat it straight sometimes :) Cacao powder was a nice add-on. Thanks for this recipe and the comments about the avocado. It does taste like arugula but didn’t find it bitter at all. Here are the ingredients I used. I added some walnuts to help with the fat soluble vitamins in the arugula and spinach. Thanks for sharing your version of this recipe, it looks delicious! I like the addition of walnuts, something I rarely use in my smoothies. Oh, THANK YOU, THANK YOU, THANK YOU… for offering this recipe!!! *inspired by Ryan Carmody’s Healthy Smoothie website – THANK YOU! Green smoothies during the holidays is a great way to avoid the typical traps most fall into. I love that you modified my recipe to make your own unique creation – soaked almonds, probiotics, flax oil, and spirulina – awesome add-ons! Thanks much! What a great way to use up arugula that’s losing its freshness. Very nice, Amber! Your version sounds delicious – love the vanilla Greek yogurt. Thanks for sharing. Loved this sooo much! So tasty! I’m a pretty simple guy…as are my smoothies. I used on cup of arugula, 1 pt strawberries, 1 cup of almond milk and one scoop of protein powder along with a teaspoon of honey. I’m a pretty simple guy myself :) Thanks for sharing your version of this smoothie. I just began my green smoothie life change. Fantastic! Welcome aboard the healthy smoothie train to better health :) You made one delicious looking smoothie. I just started a weight loss program incorporating exercising and substituting smoothies for breakfast and lunch. My wife bought mixed greens with arugula in it. I quickly discovered that making a good tasting smoothie out of it will be a challenge. Thankfully, I found your site. That smoothie was delicious! I did substitute coconut milk for the water and added all plant protein powder. This site is marked as a favorite. That’s music to my ears :) If you get creative and strategic you can blend just about anything into a smoothie and have it taste good. Good luck with your weight loss program! Very nice, Jaslyn! I like the 1/2 cucumber. Was looking for ways to use my arugula and you’ll hitting the spot with these great recipes; thanks a bunch! A bunch of arugulas, that is : ) !!! Well done, Jake, well done! You the man, Uncle Tom! I just made this smoothie and I loved it! I added a few tablespoons coconut milk and some honey for sweetness, along with a sprinkle of ground sea salt, tsp. coconut oil, and I used 1 cup organic baby arugula, as I didn’t have spinach. This smoothie is a great way to get your vitamins and it is very nutritious! The banana adds a creamy texture. Next time I will get spinach and try it with that. Very good, Safina! Love all the add-ons, especially the arugula. Oh and it does make a lot of smoothie, about 3 cups so that would be 3 small servings or 2 bigger servings. I will probably split the recipe in half next time, because I am the only one who drinks it! And the arugula doesn’t overpower the smoothie at all! Add some ice if you like your smoothies cold (maybe around 1/2 cup). I omitted the sea salt and honey and added a few things I had around and had it for breakfast this morning. I must say it tasted sweet and yummy and it turned out to be a pretty light green color and although it did have a slight peppery taste from the arugula, it was very faint and was masked enough for me. I love it, Esther! You took my recipe to the next level. Thanks for sharing your nutritious and delicious version. Nice to hear your enthusiasm for this smoothie, Evie. I decided I wanted something really light so I just blended: 2 cups of water, 2 handfuls of arugula, a small knob of fresh ginger and half a peeled English cucumber. It’s delighful! I love the addition or arugula to smoothies! Very nice, Louise! Arugula is one of my favorites.